So you have decided that you want to become your own boss and start a business. Maybe you have even decided that Gutter-Vac would be the business for you. Maybe you are still looking around, deciding what you would like to do to get started in a business and maybe Gutter-Vac is on your list. No matter what stage you are at, then there are 3 simple questions you should ask yourself to determine if Gutter-Vac is the business for you…. 1- Do you want to work outdoors and are you ok with working at heights? 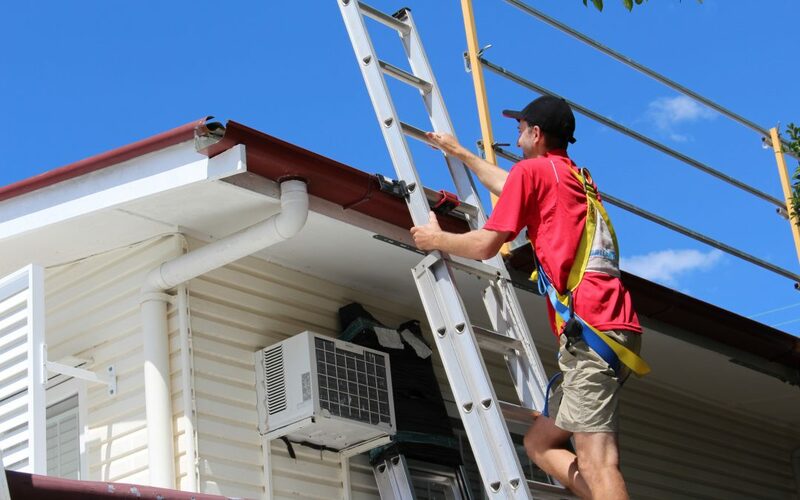 It might seem like an obvious question but it is the first you should ask when considering Gutter-Vac. Some people love to work outdoors, going from location to location, being on the move not stuck behind a desk in a windowless office, but for others, this is not their idea of a great way to spend their days! All of our franchisees are fully trained and insured to work at heights. We have a sister company – Ballantyne Safety – which is a registered training organisation and can deliver a full working at heights course to anyone working at heights. All of our franchisees – and their staff – are put through this training. So as long as you are ok with working at a height, we can train you to do this safely. If you are afraid of heights, then we are probably not the business for you. 1- Do you like to be part of a community? The biggest benefit to franchising for a franchisee is that they become a part of a community. Not just any community, but a community of people that are all running the similar business to you, with real life, everyday knowledge and insights that they are totally willing to share with you. You see, when you are in a franchise, the other franchisees are not your competition! They are there to help you and you in turn, in time, will help them as well. At Gutter-Vac, we take a lot of time and effort to help franchisees to be able to experience, benefit and contribute to the Gutter-Vac community. In fact, the franchisees often joke and say that when they have new information or learn something new, that they bring that information ‘back to the family’. Gutter-Vac was started by Warren and Anne and they are still a huge part of the day to day operations of Gutter-Vac. With this, they bring a family owned business value to the Gutter-Vac network so it is no surprise that the franchisees call it ‘the family’. If you want to be part of a supportive group of people that want to help you and see you do well – as your peers who have no financial benefit what-so-ever in your success – AND you would like to contribute in that same way, then maybe you are a perfect fit for Gutter-Vac. 3- Do you really want to be your own boss? This may seem like a silly question because you could be like ‘Hey, I’m here, reading this so of course I want to be my own boss’, but have you really thought about this fully. Yes, we are here to train, help, guide, support you in every way we can, but also, at the end of the day, it is your business and you are in charge of making it a success. We can lead the horse to water, but the horse has to decide to drink (sorry we referred to you as a horse!). Starting a business requires a massive leap of faith and we don’t ignore that fact or that it will bring a lot of mixed emotions for you getting started and running your business. You will have to work hard to get your business moving – nothing comes without effort. We will certainly help you to make sure you are working hard on the right things so your efforts are not wasted, but there is no denying, it will take work and effort to make it happen. You will need to do marketing, complete quotes, talk to people, do the physical work of the business, your administration and accounting…. This all takes effort and some will take learning a new skill. We have been doing this for 20 years…. We know how to help people and how to help them succeed. They just have to bring their willingness to follow the steps and put in the effort. So are you ready for that? Hopefully, you have seen from these questions that you don’t have to over complicate your decision and maybe this has even lead you to being one step closer to joining the ‘Gutter-Vac family’. We’d love to have you come on board! Why not look around our website a little more, send us an email, give us a call, take the time to have a chat with us so we can help you make the right decision for you!